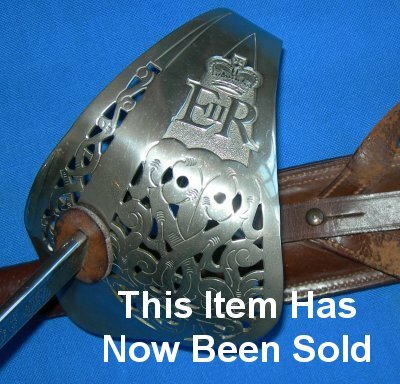 Serial number 97779 for 1970, possibly just outside parade ground condition / potential due to the small amount of tiny "crazing" to the hilt. But nonetheless in very good order, a Queen Elizabeth 2nd / ERII British army officer's sword, scabbard and suspension belts. The 32 1/2 inch (7/8 inch width at ricasso) is in good to very good condition, some patina / wear but not much, and is firm in the hilt. 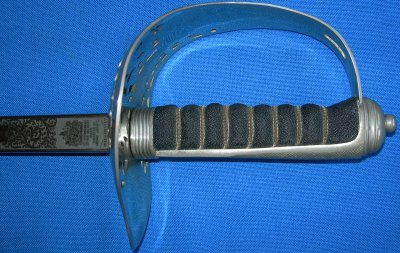 The hilt has some of the slight small crazing of the plating; the plating is still there but there are tiny little wiggly lines under it here and there; this is the stage before plating loss; it can be maintained but can not be improved, unless the hilt is replated. The black faux fishskin grip and twisted grip wire bindings are in very good condition, the fishskin a little stained but would clean up if required. The sword sheathes and draws very well. The leather field scabbard is in good condition, the suspension belts aged and cracked.